The main sessions of the conference are held on campus at the Women’s Center, and usually there is a display of art for the duration of the conference. This year’s featured work is IndiaWorld by Preston Merchant. 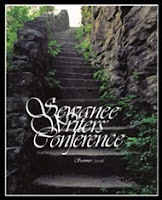 >Not a blog from this year, but a post this year inspired by last year (from Donna Trussel via 32Poems): Things to Take to a Writers' Conference. >Thanks, I'll take a look.